"It begins with us," Hankins said. "We want peace in our streets." JENNINGS, Mo. — A community came together to march for peace. Erika Hankins took three of her nine children to the peace parade in Jennings. Hankins said she has seen a real transformation in her community, with less crime and more opportunities for kids. Her own children stay busy playing sports and she makes sure to stay engaged in their lives. “I work with the school district, volunteering. My boys play football, baseball, basketball with the community programs, keeping them active,” she said. 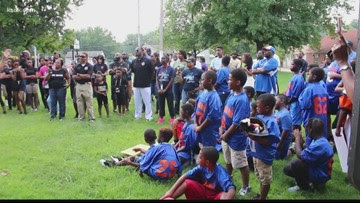 Organized by the St. Louis County Police Athletic League, the peace parade gave families and police officers a chance to build trust and get to know each other. “I think it's important for the kids and the police to get to know each other as people and not just as a role or an idea that they might have,” said Diane Davis, PAL board member. The PAL organizes activities and sports teams for children.